I have divided my description of this unique sound mediation into two parts. Part One is a basic overview of an ancient document that describes how the Bodhisattva Kuan Yin attained Enlightenment. I also present the basic method for listening to the sound meditation. If you wish to have only the basic pre-requisite understanding required to benefit from this sound meditation, then you only need to read Part One. A link to the audio file containing this sound meditation appears after both Part One and Part Two. For those of you desiring to have a more in depth discussion of the sound meditation, a little bit of its neuropsychology and its context within the Buddhist Dharma (the Way of Enlightenment), proceed to Part Two after you read Part One. This will give you some food for thought and a deeper insight into how this method of mental training can lead to illuminated states of Mind. Legend has it that Gautama Buddha once called all of his enlightened disciples together to discuss with them the methods they used to reach Enlightenment. The Surangama Sutra is a record of these discussions. While the Surangama Sutra exists as an actual document, some Buddhist scholars question whether the sutra was written at the time of the Buddha or at some point after his passing. Nevertheless, this sutra offers striking insights into various methods for enlightening one’s mind. Among the disciples called by the Buddha to reveal his meditation method was a Bodhisattva of Compassion revered by both Buddhists and Taoists alike—Kuan Yin. In Japan, Kuan Yin is called Kannon and is sometimes conceived as a Bodhisattva who can express him/herself as the duality of either a male or female. According to the Surangama Sutra when the Buddha asked Kuna Yin how he attained Enlightenment, he replied that he went and sat by the ocean every day and listened to the waves. But his focus was not on the sound of the waves, per se, but rather he was attending to or putting his mental focus on his ability to hear the waves, a unique ability of consciousness called audial hearing—or an awareness of the capacity to hear. This shifting of his attention from the actual sound of the waves to an awareness of his innate ability to hear the waves pivoted his consciousness (Mind) so that he became increasingly aware of awareness being aware of itself. This awareness of one’s own capacity to be aware is, indeed, one sense of the word Enlightenment, i.e., as in being “awake.” In this case, awake refers to waking up from the dream of dualistic existence to a greater aspect of one’s being that is both a part of and transcendent to all phenomena. Do not engage the meditation in situations requiring attention such as driving a car or operating machinery. It is best to listen to this sound meditation with stereo headphones or stereo ear buds at low volume. The reason for setting the volume in the lower range is because you are using the sound to support yourself to self-reflect by engaging your audial awareness. If the volume is too high you may find it more difficult to cultivate this unique state of mental awareness. Audial awareness is a type of mental art form, and like all new skills it may take a while to get the hang of it. The important thing is to relax into your awareness of the sounds. This is not, and I repeat not, a form of mental concentration. In fact, if you try to concentrate you will constrict awareness and not free it. This would be the opposite effect that is intended. There is nothing to concentrate on. You are simply focusing on your ability to be aware of sound—in this case the sound of ocean waves and the chant of Kuan Yin, which I sing intermittently throughout the meditation. In the tradition of mantra, the being to which the mantra refers resides energetically within the sound. Thus from this perspective the sound meditation is permeated with the presence and subtle energy of Kuan Yin. As you listen to the sound meditation simply relax into an awareness of hearing the sounds. This is different from normal listening where you focus on the sounds themselves. In this form of audial meditation you are focusing on your own awareness and your innate ability to hear sound—a subtle but vital distinction. When thoughts intrude don’t fight them. Let them be without any resistance. Just keep some part of your awareness focused on your ability to hear the sounds. If you find that your mind is distracted by thoughts or mental imagery that is okay. Don’t resist any thoughts, feelings or imagery that arise; just bring your mental focus back to your audial awareness when you realize that your awareness has strayed. For beginners, straying off into thoughts is a common experience so don’t get frustrated. Be patient. All you need do at the beginning, as you learn how to listen with audial awareness, is to have some portion of your awareness focused on being aware of the sound. In addition to the sound of ocean waves you will occasionally hear the sound of chimes as well as me chanting at different pitches and timbres. These contrasting sounds, their tonality and rhythm will affect you differently, and while you may indeed become aware of how these subtle alterations in sound are affecting you, your primary focus remains on your own awareness. In other words, the sounds you hear are in the background while your awareness of being aware of the sounds is in the foreground. From a purely psycho-neurological perspective, when Kuan Yin sat by the ocean and listened to the sounds of the waves he/she was activating a very significant region of his/her brain called the Reticular Activating System (RAS). This bundle of neural networks sits in the brain stem, and when you hear a calming repetitive sound pattern the RAS tends to slow down brain wave activity in various regions of your brain including your neocortex. In other words, the repetitive sound of the waves lulled Kuan Yin’s nervous system into the relaxed and receptive mental states of increased alpha and/or theta activity. These types of brain wave patterns have been scientifically documented to affect mental perception in highly creative and unusual ways. While I have no question that Kuan Yin’s RAS (Reticular Activating System) was a factor in his mind-altering meditations that took place by the sea, there was another important element at play. As I said in Part One, when the Buddha asked Kuna Yin how he attained Enlightenment, he replied that he went and sat by the ocean every day and listened to the waves. But his focus was not on the sound of the waves, per se, but rather he was attending to or putting his mental focus on his ability to hear the waves, a unique ability of consciousness called audial hearing—or an awareness of the capacity to hear. As I mentioned in Part One, in the tradition of mantra the being to which the mantra refers resides energetically within the sound of the mantra. Thus, from this perspective, the sound meditation is permeated with the presence and subtle energy of Kuan Yin. The mantra for Kuan Yin (Om Maha Karuna Hri Kuan Shi Yin) transmits blessings for those open to receiving them. By the word blessings I specifically mean that you can be elevated to higher states of consciousness by simply hearing the mantra. This is a temporary elevation, but it can give you glimpses of the compassionate state of Mind that is Kuan Yin. There is nothing you need do in order to receive these beneficial emanations. The transmission of blessings from Kuan Yin occurs automatically without any effort on your part. The odd thing about this particular sound meditation is that while the mantra of Kuan Yin emanates blessings of Enlightened Mind to you when you hear the mantra in the background (i.e., at a lower volume than the sound of ocean waves), your focus is not on the mantra or the sound of the waves but on your innate ability to hear the sounds. It is important to relax into this type of awareness. It is not a form of concentration, and if you try to concentrate you will not attain the relaxed view that is required to experience audial awareness. To use a metaphor, concentration is like holding a closed fist. Relaxed awareness is like holding a feather in your opened palm. This is how you would ideally hold your mental focus—by simply relaxing into an awareness of your ability to hear the sounds. Another way to look at Kuan Yin’s Enlightenment Sound Meditation is to consider it as a meta-level construct. By this I mean we normally hear sounds and that is what we focus our attention on. This is the first level of hearing—actually hearing the sound. The next level (Meta-level) is a state of awareness that is different from your normal way of hearing. You do not focus on the sounds in this Meta-level. They are in the background of your mental focus. Your relaxed focus is on your own awareness—specifically your ability to hear the sounds. This shift in focus causes you to enter profoundly calm states of body and mind. You can enhance your meditative experience with this sound meditation by entering into the feeling of being surrounded by a large space before you begin. By recalling the feeling of being in a large space, you activate the spatial intelligence of your right cerebral hemisphere. And this will magnify your inner experiences. It is important to recall the feeling of being surrounded by a large space. Thinking about it will not work. You have to experience the actual kinesthetic feeling of being surrounded by a large space in order to engage your right hemisphere’s creative abilities. It doesn’t matter what type of space you imagine just so long as it is vast. If you wish to deepen your meditative experience further, imagine that there is no difference between the inner space of your body and the space around you. At its most profound level, you imagine the space between the atoms that comprise your body and realize that there is no difference between this inner space and the outer space of the cosmos. This temporary dissolution of spatial boundaries often amplifies the altered states generated by this type of meditation. The only caveat here is that when you are finished with the meditation clearly bring your awareness back to your physical body and its normal sense of physical boundaries. This is Tom’s quintessential teaching on the topic of Chitananda Tantra, the root of which means knowledge of bliss. This complete set of eight CDs contains the entire workshop and includes extensive discussions about the philosophy and methods of this unique tantra (energy practices for the mind) as well as fourteen mind expanding sound meditations. Click here to read more and to hear a sample from the recordings. This single CD begins with a talk about tantric union and the concept of kalachakra and then moves into a potent sound meditation that joins Chenrezig (a Tibetan Buddhist Bodhisattva of Compassion) with White Tara, also known as the Swift Protectress, in a kalachakra union for the purpose of emanating beneficial energies of enlightened Mind to all sentient beings. Click here to read more and to hear a sample from the recording. 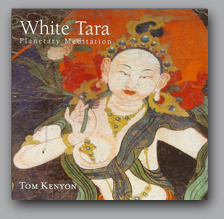 These powerful tutelary (protector) meditation beings impart their shakti (or spiritual powers of illumination and enlightenment) through eighteen potent sound meditations that use Tom’s nearly four-octave range voice to transport the listener into transcendent and liberating states of mind and body. This CD consists of a talk about White Tara, a Tibetan Buddhist Bodhisattva of Compassion and includes an in depth sound meditation that immerses you in the benevolent influence of this compassionate goddess for the purpose of emanating spiritual light for the benefit of all sentient beings and Earth. Click here to read more and to hear a sample.